← Cornmeal-Crusted Tilapia with Green Mango Salad, Two Ways! 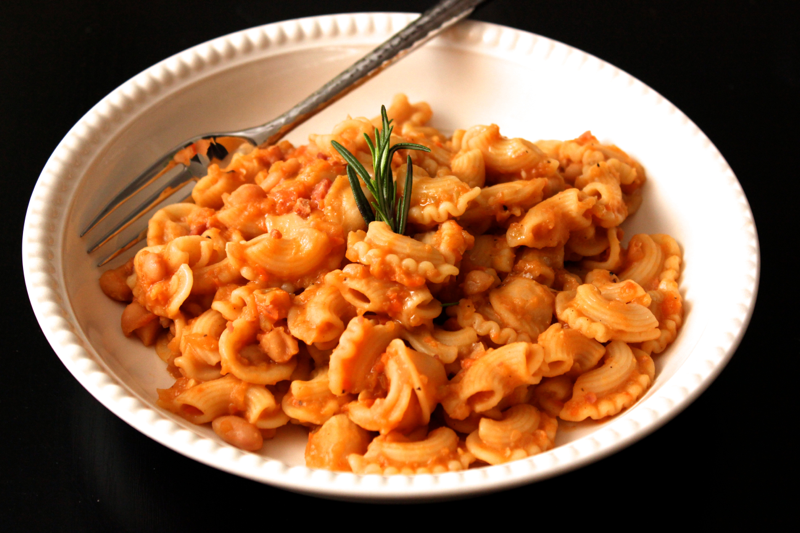 This pasta recipe is flavorful and delicious. The noodles serve as a delivery mechanism for the vegetable-based sauce and fragrant rosemary-garlic oil. I don’t think I’ve ever made a sauce quite like this one before, but rest assured that each step is intended to layer in as much flavor as possible. 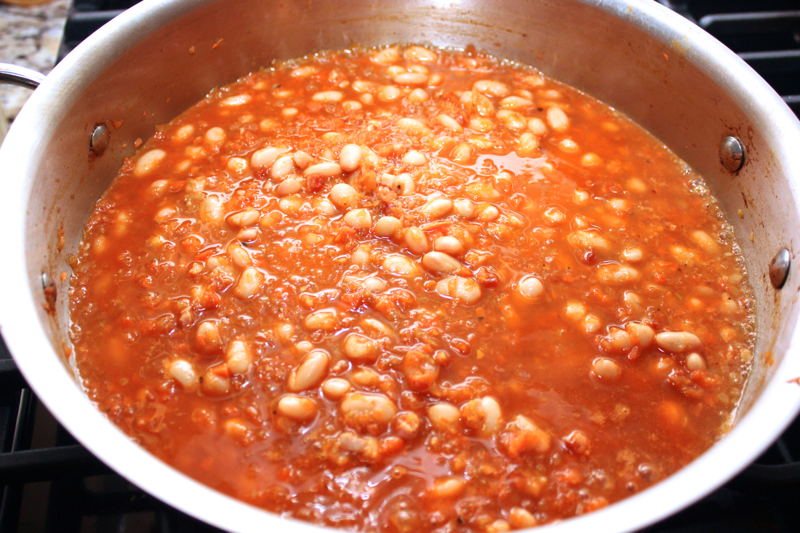 The addition of white beans and pancetta makes for a hearty meal, one that is especially well-suited to provide comfort and warmth on a below-freezing night. To begin, pour 1/4 cup of olive oil into a small pot. Add in 1 crushed garlic clove and 1/2 sprig of fresh rosemary. 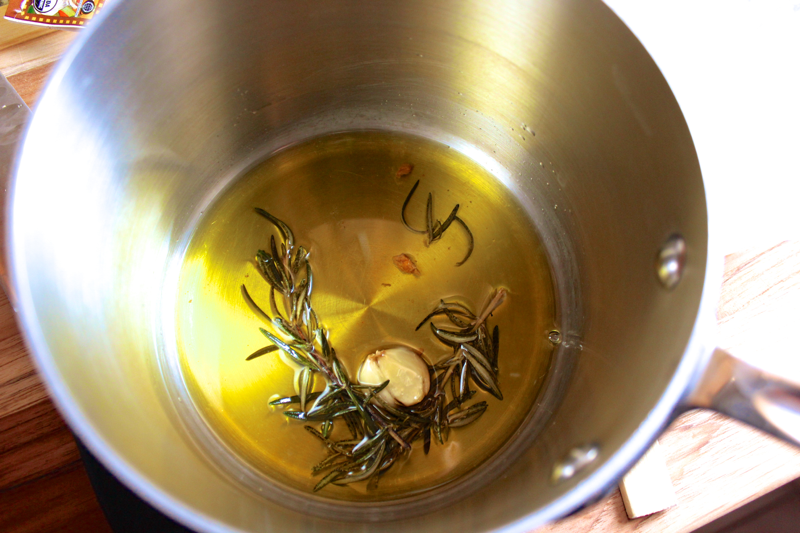 Heat the oil over a very low flame so that bubbles form around the rosemary and garlic without letting them burn. Let the garlic warm and infuse while you prepare the rest of the meal. 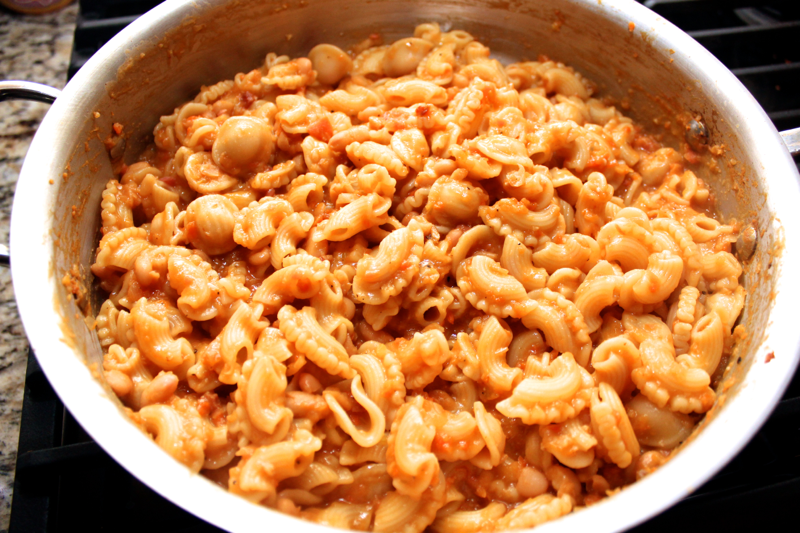 Bring a pot of salted water to a boil, and cook 1/2 pound of small-shaped pasta (I used a mixture of orecchiette and macaroni) until it is al dente. When the pasta has finished cooking, remove it from the water and set it aside, reserving at least 1/2 cup of the pasta water to use in the sauce later. While the pasta cooks and the oil infuses, prepare the sauce. Cut 1/2 onion, 1 carrot, and 1 celery stalk into chunks. 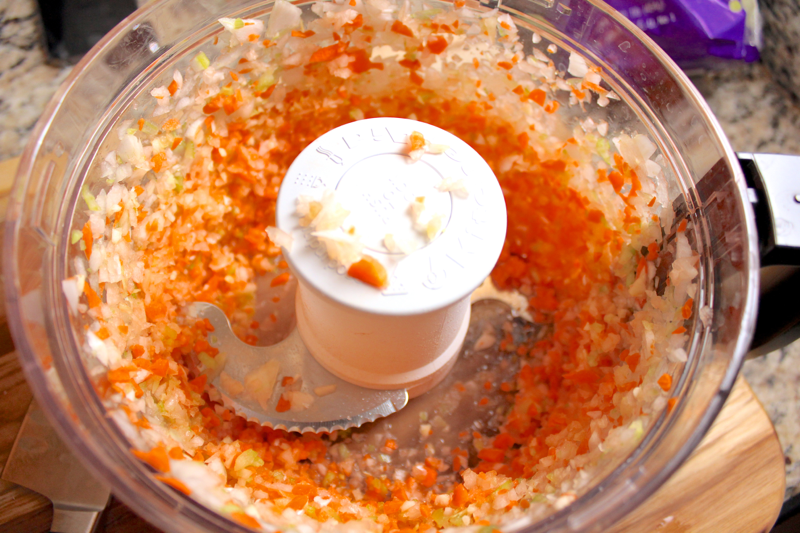 Add the chunks, along with 2 garlic cloves, to a food processor, and pulse them into small bits. Add 2 ounces of diced pancetta to a sauté pan or pot with olive oil, and heat them until the pancetta has mostly rendered its fat. Then, add the vegetables from the food processor into the pan, along with some salt, and sauté them until they begin to take on some color. 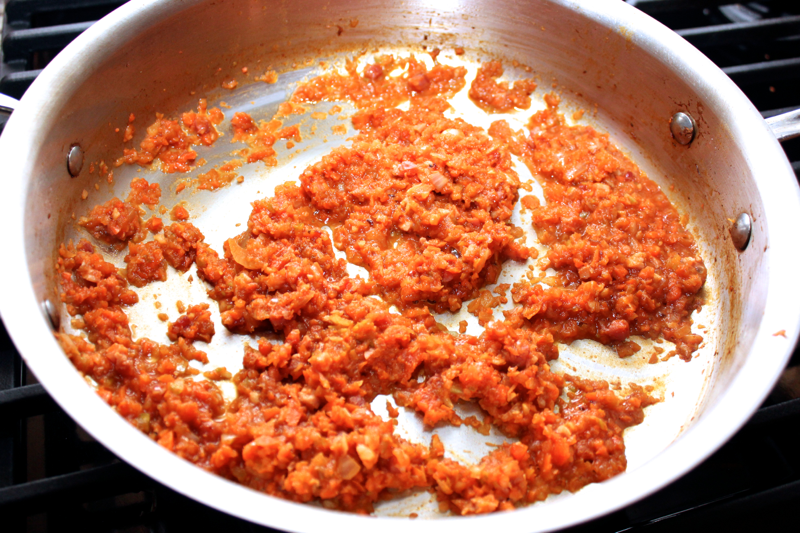 Add 1.5 tablespoons of tomato paste into the pan, and stir it into the vegetables. Pour 1/2 cup of white wine into the pan, and scrape up any browned bits. Let the wine cook off. 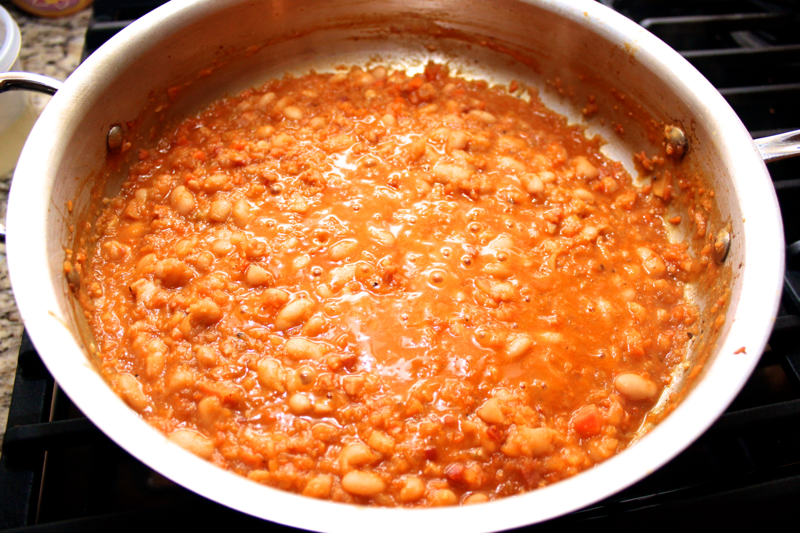 Next, add 1 can of rinsed white beans to the pan along with 1.25 cups of chicken stock. Let the sauce simmer for about 10 minutes until the vegetables are completely soft. Scoop 1/2 cup of the sauce back into the food processor, and purée it. Stir the purée back into the sauce to help thicken it. Taste the sauce, and season it with salt and pepper as needed. 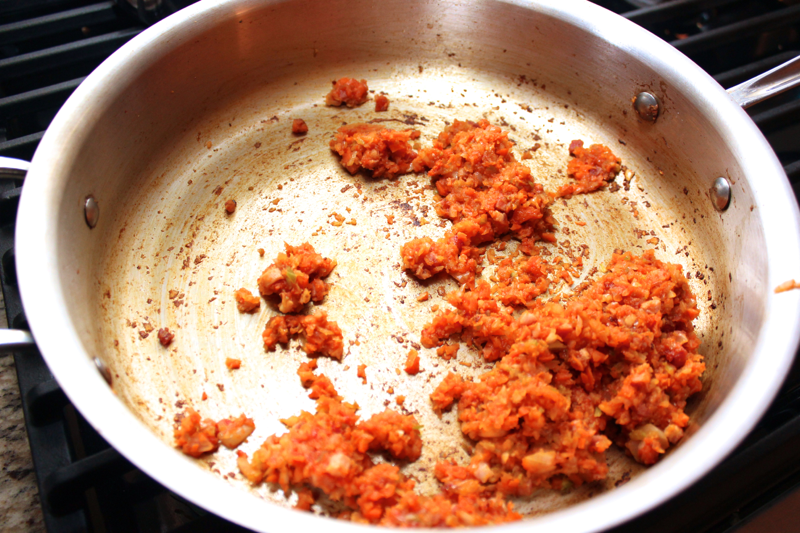 Pour the cooked pasta into the pan, and add in about 1/2 cup of the pasta water. Stir the pasta around until the sauce thickens up and fully coats the noodles. Drizzle the top of the pasta with the rosemary-garlic oil. Portion the pasta out into bowls, and finish each with a sprinkling of flaky sea salt. The infused oil adds a whole extra dimension of flavor to this pasta, and it should not be missed. If you have more oil than you need, strain out the rosemary and garlic, and store the oil in the refrigerator. 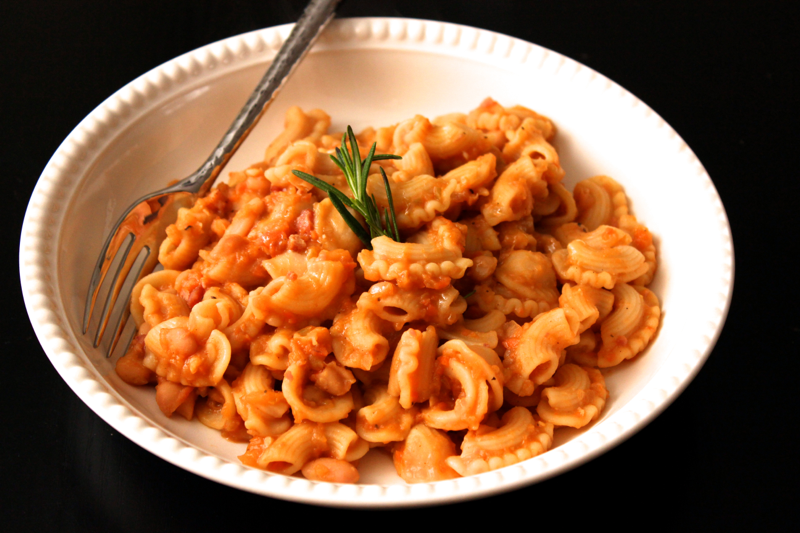 One of my favorite parts about this pasta is how the orecchiette seems to hug itself around the white beans. It’s so cute!